Pappy. It is one word in the Whiskey world that everyone should know. Hailing the Old Rip Van Winkle distillery, the 15 Year Pappy is a 107 proof behemoth of a bourbon. Its nose fills the nostrils with a strong and bold caramel reduction kind of aroma. I could sniff it all day. Vanilla, honey, and oak are all present on this nearly perfect bouquet. 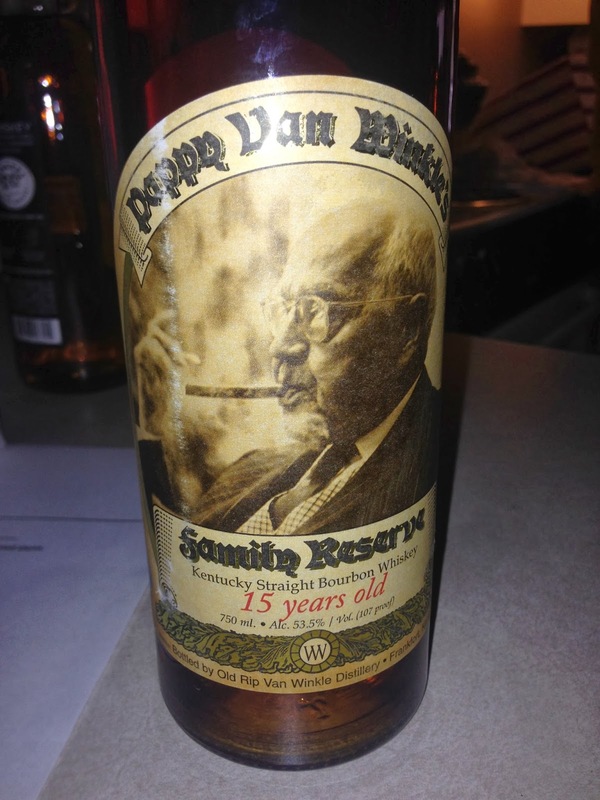 Seriously, somebody needs to invent a candle that smells like Pappy 15. The wheated whiskey slams into your taste buds with a vengeance. My tongue tingled from the singe of the cinnamon-like spice profile. The heavily boozy bourbon lingers around on the back end, too. It is astringent and viscous, staying with you from the lips down your throat as it burns on the end while trickling down like syrup. But it hurts so good. It is high octane but even fuller on flavor. There is so much beauty going on in this bourbon and it is perhaps even masked by being 107 proof. I should have tried it again with a few rocks or just a dash or two of water to open it up some. Good thing I have more, so I can. This whiskey is rare. If you ever see it available, make sure to grab it while you can. It may be even more rare after the recent bourbon heist, but that mostly saw stolen 20 Year Pappy, the slightly more aged brother of the 15 Year. I got my bottle from the kind heart of Todd at the Turtle Bar at Houmas House. He might have it available by the dram for anyone who wants to try it. I owe that man a steak or something. I'm giving away two spots for this upcoming leisure class at the Louisiana Culinary Institute to one lucky winner. You and a guest will be able to attend the class on Monday, November 4th from 5:30 to 8 PM. Chef Derrick Beverly will show you how to use and feel comfortable with your kitchen knives. He will show you how to properly cut vegetables, meats, and fish. He will also teach you basic cooking techniques that you can use in your own kitchen. Plus, you can bring your kitchen knives and get them sharpened (limit 3 per person)! At a minimum, a chef's knife is required for this class but you might as well bring your whole set or at least three that you'd like to get sharpened. The two tickets to this class are a $250 value that I'll be giving away to one lucky reader! To win, leave a comment below telling me how you'd like to improve your knife skills. It could be learning how to properly hold a knife, learning when to use each kind of knife, or getting pro tips on how to chop and onion or dice a bell pepper. 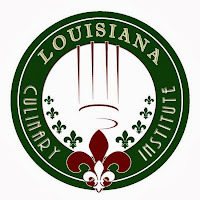 For an extra chance to win, send a tweet to @biteandbooze and @LAculinary with the link to this post in it or mention Bite and Booze and the Louisiana Culinary Institute on Facebook when sharing the link to this post! You have until the end of the day on Wednesday to enter and I'll be informing the winner of their free leisure classes on Thursday! Also, gift certificates for LCI leisure classes are available and are perfect for holiday gifts. If you know anyone interested in cooking or entertaining, they'll love an LCI leisure class! 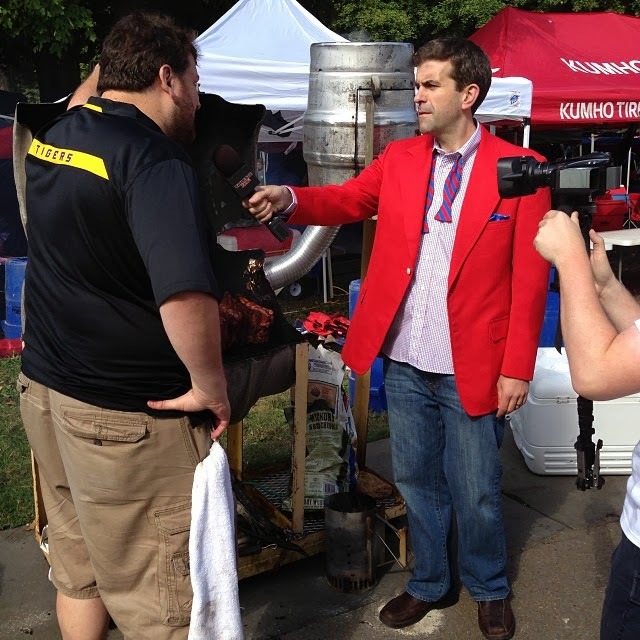 While at The Grove on the campus of Ole Miss in Oxford, MS last weekend I felt like a bit of a celebrity tailgater. Not only was Bon Appetit there to cover the party and my cooking for their magazine, but I also had encounters with both Louisiana Travel and CBS's Tailgate Fan. Plus Taylor Mathis from the Southern Tailgating Cookbook (of which I am on the cover!) hung out for a while! Tailgate Fan, hosted by Nick Stevens, travels the country exploring tailgate parties and the debauchery that they entail, as well as the cuisine, of course. They caught me as I had ribs on the smoker and chicken stock cooking for the gumbo. 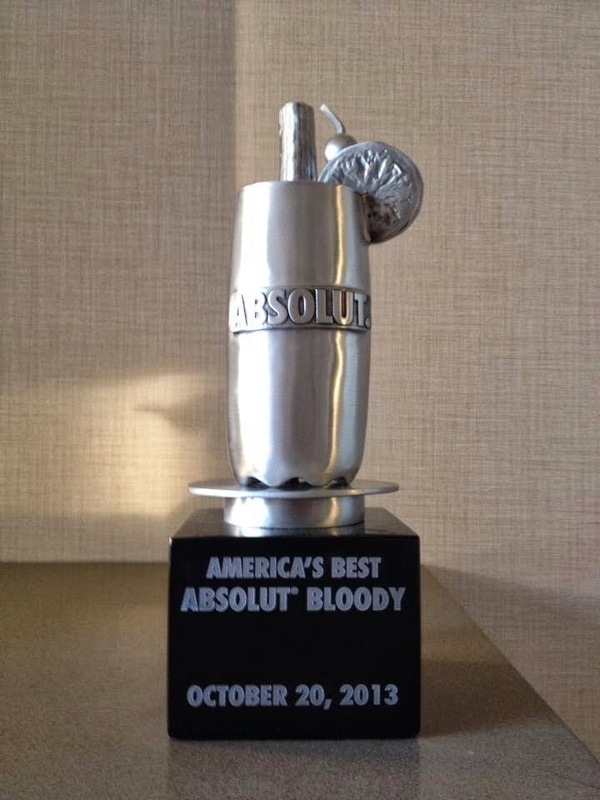 It is always fun to show off the Monstrosity while at tailgate parties and barbecue cookoffs. It is incredible how much attention it brings to the tailgate party. In addition to ribs and chicken and andouille gumbo, I also made a big pot of braised mustard greens and some Creole potato salad. Needless to say the tailgate party, including all the Ole Miss fans that allowed us to set up next to them on the edge of the Grove, were well fed and very happy to have me around. The entire trip went extremely well despite the LSU loss. In all seriousness, the Rebel Nation proved to be extremely friendly and accomodating. I was told multiple time "Thanks for being here" and "I'm glad you made the trip," and that was by fans who weren't eating my food. Also, while The Grove is a completely different experience than LSU, the novelty of it is truly worthy of all its high praise. The amount of people that they pack into The Grove is incredible. It is like if all LSU tailgate parties had to be on the Parade Ground. It seems insane, and I'd dislike it if it were the case at LSU, but making the trip to Ole Miss should absolutely be on everyone's must-do tailgating list. 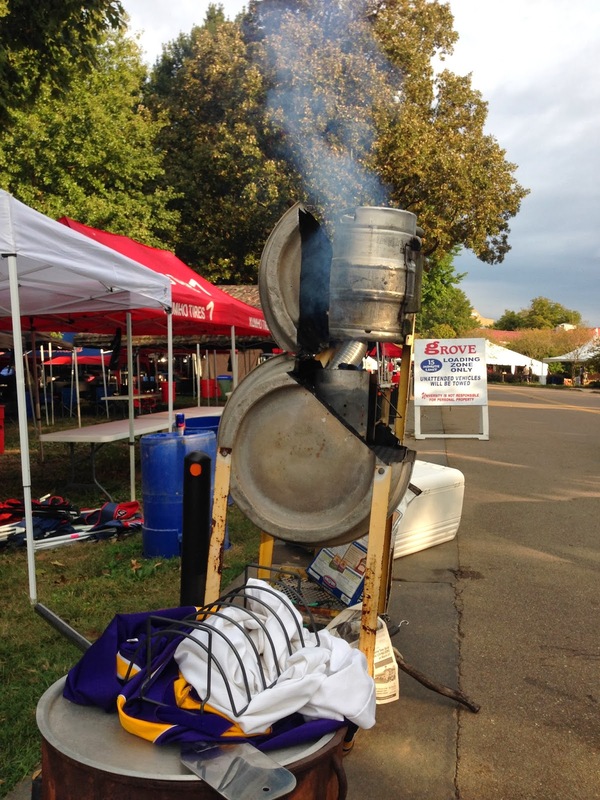 The Monstrosity began billowing smoke on the edge of The Grove before Ole Miss fans arrived. I miss Ireland. I miss the rolling hills and the friendly small town pubs. I miss waking up in hostels and seeking adventure. I miss fresh pints of Guinness. And I miss sipping on whiskey with anyone whose last name started with O'. I recently received a bottle of 2Gingers Irish Whiskey, a newcomer to the scene which wasn't around in 2006 when I traversed the Emerald Isle. 2Gingers smells like Ireland. On the nose are perfumes of fresh cut grass, honey, and refreshing sweetness. Upon making contact with the tongue the sweetness fades into hay and grain. It is light and easy to taste with a hint of honeysuckle. It disappears like a magic trick on the finish, vanishing off the back of the tongue leaving your mouth dry with very little aftertaste. Ultimately its fleeting qualities were not ideal. Jeremy dubbed it a "chick whiskey," though he clearly meant no offense to Irish whiskey in general as it is one of his favorite categories. The nose easily stood out as the best part of 2Gingers as everything else proved to be rather boring. Still, this is certainly a decent introduction whiskey to the Irish style, and would certainly be fine as a replacement to Jameson as a shooting whiskey. Whisk(e)y Wednesday returns to new booze with a look at Alibi American Whiskey. Distilled in Indiana and bottled in Florida, this blend of corn, rye, and malted barley is harsh and aggressive, beckoning back to how whiskey was originally served in this country. The nose is faint and medicinal. When the elixir hits your lips it lights up a fiery blast of burn. It finishes like cough syrup and then vanishes off the back of the tongue. Unfortunately, the unpretentious claims made by Alibi are there for a reason... there's not much to be pretentious about. They source their whiskey, blend into nothing special, and then put it in nice packaging hoping to sell it to people who don't know any better. While I do believe that Alibi would go down perfectly fine when mixed with Coke, that's not exactly the selling point for a new artisan whiskey brand. Ultimately, this bottle is 72.5% grain neutral spirits and only 27.5% a blend of straight whiskeys that have been aged three years or more, and it shows. 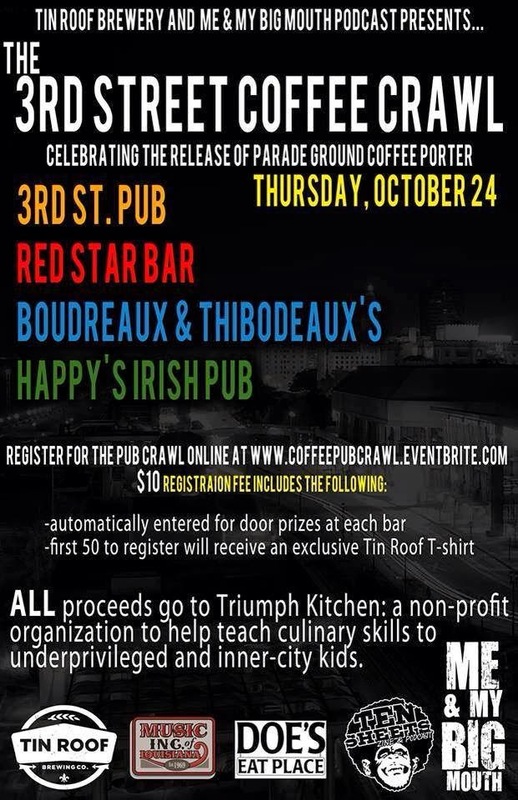 It's a pub crawl in downtown Baton Rouge to celebrate the release of the Tin Roof Parade Ground Coffee Porter. That's really about all you need to know! Oh, and it's only $10 to sign up then pint specials at each bar. More details are below or at http://coffeepubcrawl.eventbrite.com/ where you can also register and have a chance at some raffle prizes and a free t-shirt! In the latest episode of 225: Into the Mix, I track down Pat Fellows with the Fresh Truck. Fresh Junkie is all about serving bold flavors in a fresh and healthy way. You can find them at the Main Street Market or on the truck rolling around town or catering private events. When I get on the truck with Pat he makes me a Brickhouse Wrap and a Mediterranean Wrap. Seriously, I should be eating this stuff way more often. It is delicious and nutritious! The Whisk(e)y Wednesday series is now 74 deep with, fortunately for the tasters, no end in sight. However, rather than do a new whisk(e)y review today, I thought it would be great to do a recap of the top 7 scoring whisk(e)ys so far! Why top seven? Mostly because I feel like it. Also, it is pretty much the elite 10% of whisk(e)y that has been reviewed so far. If you see these on the shelves, get them! And fear not, I have some liquid coming up soon that might dethrone some of these. We'll see what's still in the top 10 after I get past 100 reviews! Click on the name of each whisk(e)y to take you to the full review. We recorded this show at the Fete Rouge event back in August but it didn't air until this past Saturday on Talk 107.3 FM. Now, for your listening pleasure, it is available here and on iTunes! Just before football season begins each year the culinary masses of Baton Rouge gather for a food and wine spectacle put on by the Baton Rouge Epicurean Society known as Fête Rouge. This year I had a chance to sit down with Chuck P. from the Me and My Big Mouth Show, Chef Sean Rivera from Niche Restaurant, Anne Milneck from the Red Stick Spice Company, Charlie Ruffolo from LCI, and Tommy Talley from Tommy's TV during the festivities to record a radio show. 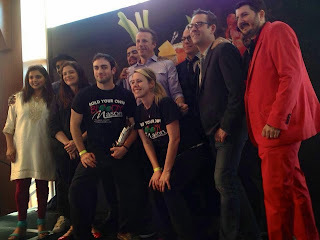 Listen to the podcast version of the Bite and Booze Radio Show for a little play by play from the event, and check out all the big winners from Fête Rouge below! 3rd Place - Ayam Nasi Goreng (Indonesian Fried Rice)- Fire grilled chicken thighs atop indonesian street rice cucumber gelee, pickled carrots & sriracha caviar. Garnished with a skin crisp & drizzled in a Soy Gastrique. 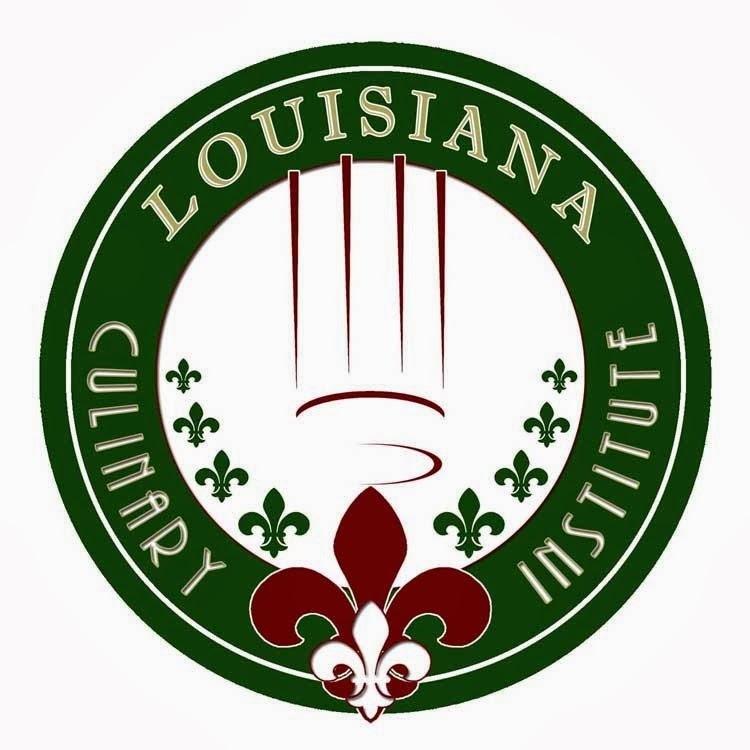 Chef Beverly & Chef Patin –Louisiana Culinary Institute. For more information, please visit www.feterougebr.com. You can never go wrong with pizza and beer, so that's exactly what I sought out in the latest episode of our web series, 225: Into the Mix. I swing by the legendary Baton Rouge watering hole The Pastime on my way over to the Tin Roof Brewing Company between downtown and LSU's campus. Fortunately for me, the guys were open to trading some pizza for a pint, and they chatted with me all about the fall lineup including the return of the Parade Ground Coffee Porter (there's a pub crawl coming up on 10/24!) and the now-released Rougarou Black Double IPA! 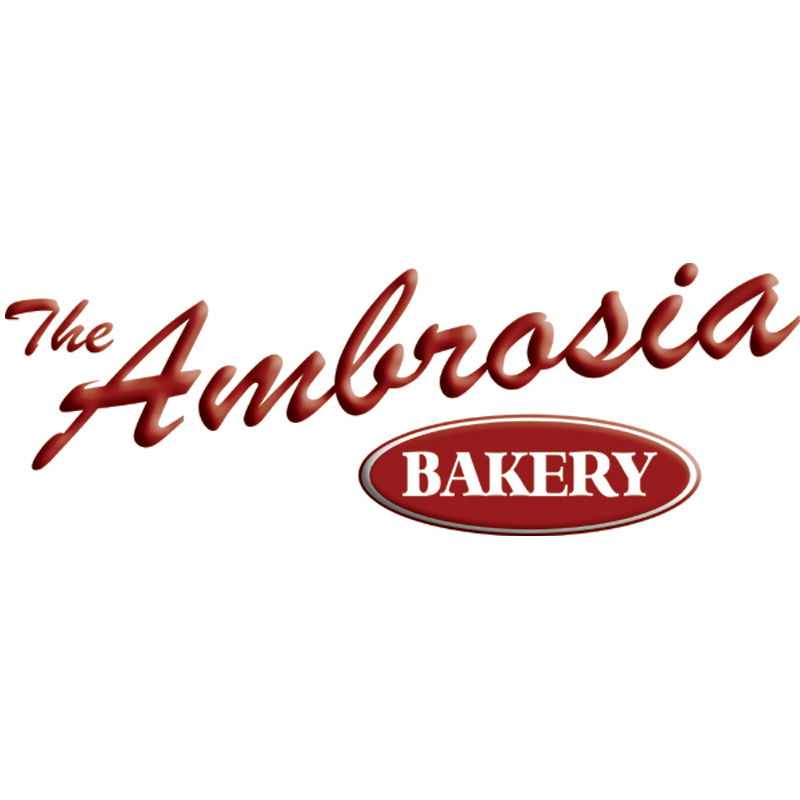 This episode of the Bite and Booze Radio Show presented by Calandro's Supermarket features the entire 2013 class of Louisiana Cookin' Magazine's Chefs to Watch. 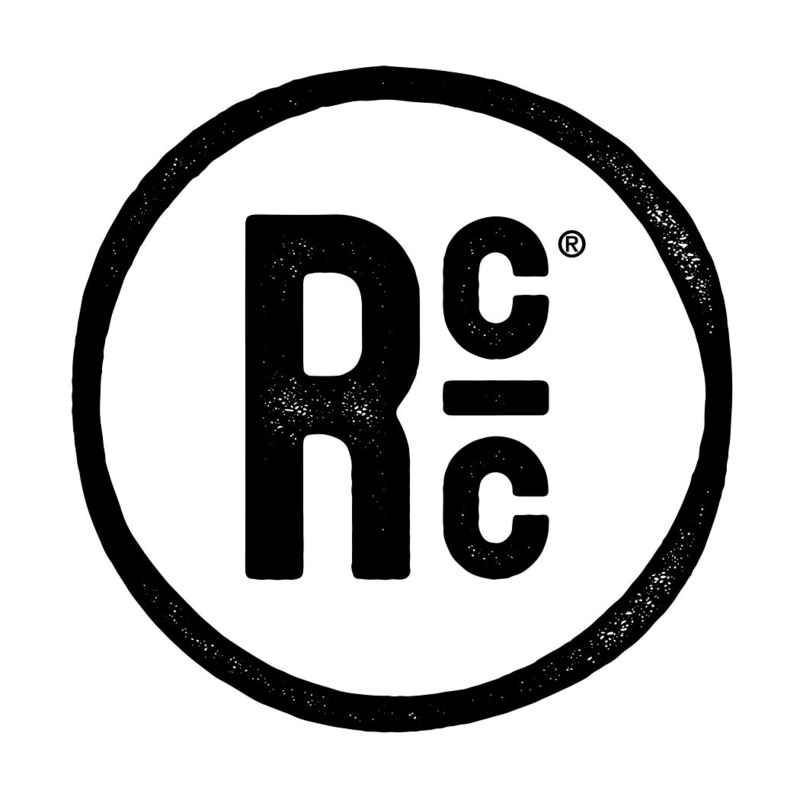 Each chef talks about their current jobs, their culinary passion, and what they'll be cooking soon at Cafe Reconcile. 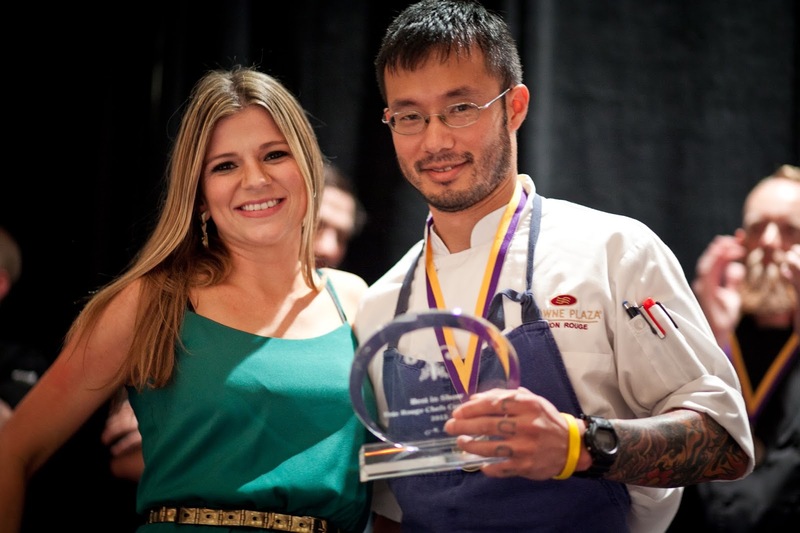 The Chefs to Watch Awards Dinner will be held on October 21st and will both be at and benefit Cafe Reconcile in New Orleans. I'll be there for sure, and you can purchase your tickets on Louisiana Cookin's website! 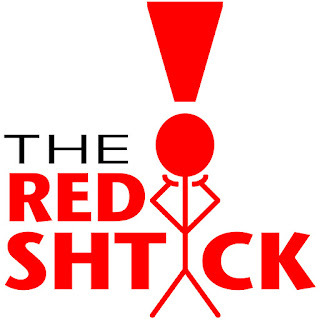 The Bite and Booze Radio Show presented by Calandro's Supermarket airs on Saturdays at 5 PM on Talk 107.3 FM in Baton Rouge. It is also available on iTunes. 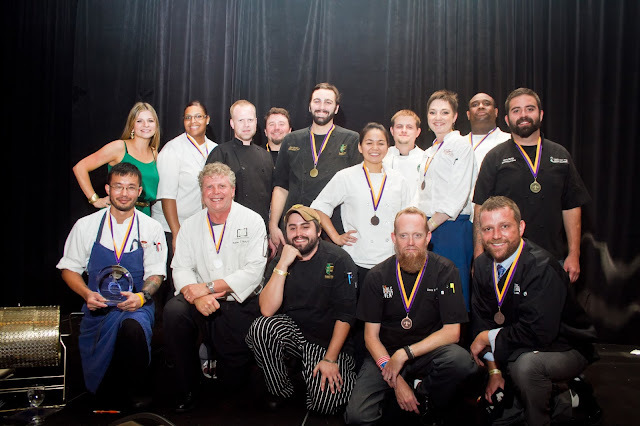 The show's sponsors include Calandro's Supermarket, Visit Baton Rouge, Slap Ya Mama Cajun Seasoning, Louisiana Cookin' Magazine, Juban's Restaurant, the Tin Roof Brewing Company, the Louisiana Culinary Institute and Triumph Kitchen.